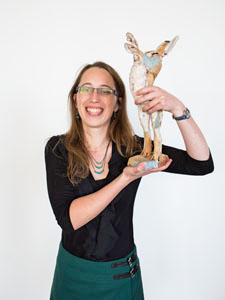 Katja Reinhard, a PhD student at Tübingen’s Center for Integrative Neuroscience, has been awarded with the Lush Prize 2013 in the category „young researchers“ with £12,500 for developing electrophysiological experiments with isolated human retina. Due to collaboration with Prof. Bartz-Schmidt and his team at the eye hospital in Tübingen, donors could be recruited for this study. The retinas originate from patients who have to undergo an enucleation due to a tumor, and from post-mortem cornea donors. Katja Reinhard characterizes the functionality of human retina on a cell and circuit level during her PhD thesis in Thomas Münch’s lab “Retinal Circuits and Optogenetics”. She adapted multi-electrode array (MEA) recordings known from animal experimentation to in-vitro work with human retina. During the experiments, isolated pieces of human retina are stimulated by various light stimuli, and the responses of the retinal ganglion cells are recorded with a MEA. Very little is known about the detailed visual information processing of the human retina, and except for a short publication in 1971 by Weinstein et al, no in-vitro electrophysiological data on human retina has been published. Thus, the novel recordings from human retinal ganglion cells will improve our understanding of the detailed functions of human retina. Further, the Münch group plans to use the developed methodology to test vision restoring approaches such as optogenetics directly on human tissue. Katja Reinhard receives a stipend from the Pro Retina Foundation. Pro Retina is a self-help organization for patients with retinal degeneration. The Lush Prize is a major initiative which will use resources to bring forward the day when safety testing takes place without the use of animals.The Lush Prize will focus pressure on toxicity testing for consumer products and ingredients in a way which complements the many projects already addressing the use of animals in medical testing.